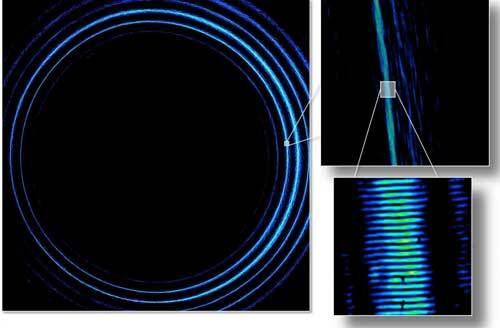 (Nanowerk News) The research team around Anton Zeilinger has succeeded in breaking two novel records while experimenting with so-called twisted particles of light. In one experiment, the scientists could show that the twist of light itself, i.e. the screw-like structure, is maintained over a free-space propagation of 143 kilometers, which could revolutionize future data transmission (PNAS, "Twisted Light Transmission over 143 kilometers"). In the second study, the researchers teamed up with an Australian research group to twist individual light quanta stronger than ever before while even preserving quantum entanglement with a second particle (PNAS, "Quantum entanglement of angular momentum states with quantum numbers up to 10010"). Similarly, these results, now published in the highly renowned journal PNAS, are not only of fundamental interest but also give a hint towards the enormous information capacity a single particle of light may offer in future applications. Time and again, properties of the light surprise the research world. For example, light can be brought into a corkscrew-like form in order to produce so-called "screws of light", as Anton Zeilinger, quantum physicist at the University of Vienna, describes. The amazing fact is that one can in principle impose any number of windings on each individual light particle - called photons. The larger the number of windings, the larger the so-called quantum number with which the photon is described. The Viennese scientists results of the Vienna Center for Quantum Science and Technology (VCQ) at the University of Vienna and the Institute of Quantum Optics and Quantum Information Vienna (IQOQI Vienna) at the Austrian Academy of Sciences have now made use of this feature in two papers, breaking previous records on the transmission distance and the magnitude of the quantum number. 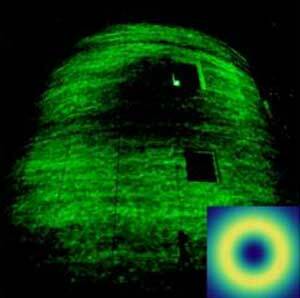 In principle, twisted light can carry an arbitrary large amount of information per photon. This is in contrast to the polarization of light, which is limited to one bit per photon. For example, data rates of up to 100 terabits per second, which correspond to about 120 Blu-Ray discs per second, have already been achieved under laboratory conditions. The transmission under realistic conditions, however, is still in its infancy. In addition to transmission over short distances in special fiber optics, transmission of such light beams over free space, required for instance for satellite communication, was limited to three kilometers so far; achieved by the same Viennese team two years ago. In the current study, the research team around Anton Zeilinger and Mario Krenn show that information encoded in twisted light can still be reconstructed even after more than 100 kilometers. The experiment has been conducted between the canary islands of La Palma and Tenerife, which is 143 kilometer away. "The message 'Hello World!' 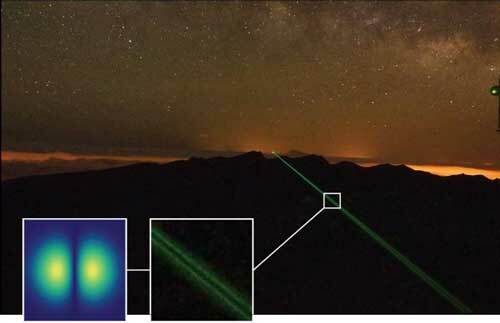 has been encoded onto a green laser with an optical hologram, and reconstructed with an artificial neural network on the other island", explains Krenn, PhD-student in Zeilinger's group. Having shown that these light properties are in principle maintained over long distances, they now have to be combined with modern communication technologies - a task which already several groups around the world are starting to address. Together with the research group of Ping Koy Lam in Canberra, Australia, the Viennese group of Anton Zeilinger also investigated how strongly single photons can be twisted into the screw-like structure without losing distinct quantum features. In other words, does quantum physics still hold in the limit of large quantum numbers or is classical physics and everyday experience taking over again? For this purpose, the researchers took advantage of a novel technique developed by their colleagues in Australia. There, they have established a technique to fabricate so-called spiral phase mirrors to twist photons in an unprecedented strong manner and thus increase the quantum numbers to huge values. The mirrors, custom-made for the experiment in Vienna, allow the generation of screw-like photons with quantum numbers of more than 10,000, which is a hundred times larger than in previous experiments.